Web Stream Attendance Still Available, In-Person attendance sold-out! Kari Zweber Palmer and Ryan Hendrix from the Social Thinking Training and Speakers' Collaborative are back in Vancouver to deliver two days of Social Thinking training. Live stream: Watch and participate live from anywhere by registering for web streaming. What looks like pure fun to us has important social consequences for the developing mind. The ability to participate in collaborative pretend play and learn as part of a group depends upon having a flexible brain, competent language ability, self regulation, and solid social-emotional development as well the executive function skills to multi-task the use of all of the above! In the U.S., the 'Common Core Standards' highlight the importance of “listening and collaboration” in the classroom, hallmarks of developmental learning in preschool and during the early elementary years. This workshop is designed to give participants knowledge of the key components of social cognitive development from birth to five years of age as they connect to the core concepts. Social-emotional growth, executive functioning/self-regulation and their interactive impact on socio-communicative abilities will also be discussed. This course will also focus on how to put the research and best practices of teaching social into action. We will introduce five Social Thinking Vocabulary concepts that have been adapted for children ages 4-7: Thoughts and Feelings, The Group Plan, Thinking With Your Eyes, Body in the Group, and Whole Body Listening. We will explore methods to teach these concepts through storybooks, music, structured activities, and play. We will also look at different strategies for service delivery in a variety of settings. Strategies for home and school are designed for young children with average to strong language and learning abilities. Discuss the difference between a skills-based approach and a social cognitive-based approach. Identify at least three key milestones that underlie the development of social cognitive skills birth to five years of age. Explain why a preschool or early elementary aged child with a social cognitive learning challenge may have trouble with learning as part of a group. Identify ways to structure learning experiences in preschool and early elementary settings. Describe ways to teach at least three Social Thinking Vocabulary concepts to students ages 4-7. Social executive functioning is at the heart of developing SCIP: Shared, Collaborative, Interactive Play. On this conference day we will teach how to move from the five basic Social Thinking lesson sets in We Thinkers! Volume 1*, our early learner curriculum, story books and music CD to the more complex lessons presented in We Thinkers Volume 2: Social Problem Solvers. This day is filled with creative activities, which align with the research and extend our thinking about how to work, play and learn in groups. Attendees will engage in group learning activities and learn strategies to use in their classroom or home the very next day! We will present concepts that include but are not limited to: The role of play and working as part of a group in the development of self-regulation, impulse control, social problem solving, and executive functioning. Why a child who has difficulty with social attention will have trouble with sharing an imagination and interacting/playing with peers. Strategies for individuals to develop the skills to decipher the “hidden rules” and social expectations in a specific context. The strategies revolve around the concepts of Flexible verses Stuck Thinking, recognizing the Size of the Problem, and strategies to stay calm, making Smart Guesses, and Sharing an Imagination. Learn to use our newest tool, Social Thinking’s Group Play and Problem Solving Scale (GPS) to understand the five different levels of play and how that relates to classroom participation and the Common Core/State Standards! Learn how the lessons and activities in the We Thinkers! curriculum are adapted for each level of the Social Thinking’s GPS. Explore how all of this is part of Social Emotional Learning that can be used in pre K-2 mainstream classrooms, connects to Positive Behavioral Interventions and Supports (PBIS) as well as Response to Intervention (RTI). *The Incredible Flexible You Volume 1 was renamed We Thinkers! Volume 1 Social Explorers. There will be no content change in Volume 1, only a name change. Volume 2 is named We Thinkers! Volume 2 Social Problem Solvers. Describe two strategies for helping individuals learn to be more flexible thinkers. Describe two strategies to help individuals learn how problem solving involves self-regulation. Describe two aspects of each of the five levels of play as explained through Social Thinking’s Group Play and Problem Solving Scale (ST-GPS). Define two different strategies to provide differentiated instruction to students who have different SCIP based play abilities. Explain how to teach students how to read the “hidden rules” to figure out what behaviors are expected in a specific situation. Kari Zweber Palmer, MA, CCC-SLP researched and wrote "The Double Interview: Assessing the Social Communication of Adolescents with Asperger Syndrome" for her Master's Thesis. 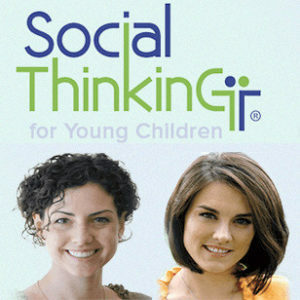 Kari trained with Michelle Garcia Winner at the Center for Social Thinking in San Jose, CA. Her diverse caseload included preschool aged children to young adults, all with varying levels of social cognitive challenges. Currently Kari has a private practice, Changing Perspectives, in Excelsior, MN. Ryan Hendrix, MS, CCC-SLP is a Social Cognitive Therapist at the Social Thinking Stevens Creek Clinic in San Jose and in her own practice in San Francisco. She trained and works directly with Michelle Garcia Winner and Dr. Pamela Crooke. Her diverse caseload experience includes preschool-age children through young adults with varying levels of social cognitive learning challenges. Ms Hendrix is an American Speech-Language-Hearing Association (ASHA) member and has a Master's Degree in Speech-Language Pathology from the University of Arizona. ACT fundraises to provide bursaries for low-income participants and/or those travelling from outside their home regions to an event. ACT only provides bursaries prior to registration. You are welcome to call or email ACT's office (info@actcommunity.ca) for more information. ACT provided over $27,000 in bursaries in 2016 and gratefully accepts donations to our bursary fund to allow us to provide a greater level of support. Donate to our bursary fund. Learn more about how to register using the ACT event bursary program. MCFD has provided ACT with funding for a bursary program for parents and caregivers of children with autism to attend ACT events at reduced registration rates until March 31, 2018. Seats will be filled on a first come, first registered basis. Each parent is eligible to receive one in-person event bursary up until March 31, 2018. Additional bursaries are available to register for web streamed events. Learn more about how to register using the MCFD event bursary program. Parents who receive Autism Funding may use 20% of the total for equipment, books, training and travel costs. ACT's live events are considered eligible expenses by the Autism Funding Branch. More information on using Autism Funding.